Yelena Georgevna Bonner (Russian: Елена Георгиевна Боннэр) (February 15, 1923 - June 18, 2011) was a human rights activist in the former Soviet Union and widow of the late Andrei Sakharov. She has been credited as one of the main inspirations in encouraging Sakharov, a prominent Soviet physicist, to use his position to attack the Soviet human rights record. Together with Sakharov, Bonner became one of the key moral forces that used the so-called "third basket" of the Helsinki Accords effectively to promote greater freedom in the Soviet Union. Their efforts helped set the stage for the policies of glasnost and perestroika during the Gorbachev era. Yelena Bonner was born on February 15, 1923 in Merv (now Mary), Turkmenistan, to Ruth Bonner, a Jewish Communist activist. Her stepfather was Georgy Alikhanov (né Gevork Alikhanyan), a prominent Armenian Communist and a secretary of the Comintern who had fled the Armenian Genocide, in 1915, to Tbilisi. She had a younger brother, Igor, who became a career naval officer. Her parents were both arrested in 1937, during Joseph Stalin's Great Purge; her father was executed and her mother served eight years term at a forced labor camp near Karaganda, Kazakhstan, followed by internal exile. Yelena's 41 year old uncle, Ruth's brother Matvei Bonner, was also executed during the Purge, and his wife internally exiled. All four were exonerated, following Stalin's death in 1953. Serving as a nurse during World War II, Bonner was wounded twice, and in 1946, was honorably discharged as a disabled veteran. After the war she earned a degree in pediatrics from the First Leningrad Medical Institute. Her first husband was Ivan Semenov, her classmate at medical school, by whom she had two children, Tatiana and Alexei, both of whom emigrated to the United States in 1977 and 1978, respectively, as a result of state pressure and KGB-style threats. Yelena and Ivan eventually divorced. Beginning in the 1940s, Bonner helped political prisoners and their families. In the late 1960s, she became active in the Soviet human rights movement. In 1972, she married nuclear physicist and human rights activist Andrei Sakharov. Under pressure from Sakharov, the regime permitted her to travel to the West in 1975, 1977, and 1979 for treatment of her wartime eye injury. When Sakharov, awarded the 1975 Nobel Peace Prize, was barred from travel by the Soviets, Bonner, in Italy for treatment, represented him at the ceremony in Oslo, Norway. Bonner became a founding member of the Moscow Helsinki Group. Founded on May 12, 1976, to monitor the Soviet Union's compliance with the recently-signed Helsinki Final Act of 1975, which included clauses calling for the recognition of universal human rights, physicist Yuri Orlov announced the formation of the "Public Group to Promote Fulfillment of the Helsinki Accords in the USSR" (Общественная группа содействия выполнению хельсинкских соглашений в СССР, Московская группа "Хельсинки") at a press-conference held at the apartment of Andrei Sakharov. The newly inaugurated NGO was meant to monitor Soviet compliance with the Helsinki Final Act. The eleven founders of the group included Bonner and Jewish refusnik Anatoly Shcharansky, among others. its pioneering efforts inspired the formation of similar groups in other Warsaw Pact countries, as well as support groups in the West. In Czechoslovakia, Charter 77 was founded in January 1977; members of that group would later play key roles in the overthrow of the communist dictatorship in Czechoslovakia. In Poland, a Helsinki Watch Group was founded in September 1979. The group's goal was to uphold the responsibility of the Soviet Union's government to implement the commitments on human rights made in the Helsinki documents. They based their group's legal viability on the provision in the Helsinki Final Act, Principle VII, which establishes the rights of individuals to know and act upon their rights and duties. The Soviet authorities responded with severe repression of the group's members over the next three years. They used tactics that included arrests and imprisonment, internal exile, confinement to psychiatric hospitals, and forced emigration. Eventually, the collection of Helsinki monitoring groups inspired by the Moscow Helsinki Group formed the International Helsinki Federation. Helsinki monitoring efforts began in the then Soviet Union shortly after the publication of the Helsinki Final Act in Soviet newspapers. However, by the end of 1981, only Elena Bonner, Sofia Kalistratova, and Naum Meiman were free, as a result of the unremitting campaign of persecution. The Moscow Helsinki Group was forced to cease operation, and it announced its own dissolution in September of 1982. The shutdown of the Helsinki Monitoring Group was part of a Soviet crackdown on dissidents. The most visible symbol of this crackdown was the arrest of Sakharov on January 22, 1980, following his public protests against the Soviet invasion of Afghanistan in 1979. He was sent into internal exile in Gorky, now Nizhny Novgorod, a closed city that was inaccessible to foreign observers and especially Western journalists. Between 1980 and 1986, Sakharov was kept under tight Soviet police surveillance. In his memoirs, he mentioned that their apartment in Gorky was repeatedly subjected to searches and heists. Nonetheless, he remained unrepentant and continued to write. During the next several years the harassed and publicly denounced Bonner became his lifeline, traveling between Gorky and Moscow to bring out Sakharov's writings. 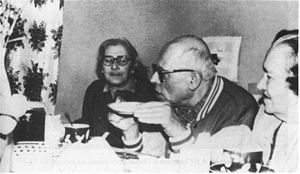 In 1981, Bonner and Sakharov went on a dangerous but ultimately successful hunger strike together to get Soviet officials to allow their daughter-in-law, Yelizaveta Konstantinovna ("Lisa") Alexeyeva, an exit visa to join her husband, Elena's son Alexey Semyonov, in the United States. They succeeded in irritating Soviet authorities to such an extent that Bonner herself became the next target. To further diminish Sakharov's influence and put more pressure on both of them, the authorities also arrested Bonner in April 1984, for "anti-Soviet slander," and sentenced her to five years of exile in Gorky. In protest, Sakharov engaged in several long and painful hunger strikes, forcing the new Soviet leader, Mikhail Gorbachev, to let her travel to the U.S. in 1985, for sextuple bypass heart surgery. In December 1986, during the period of glasnost and perestroika, Soviet premiere Mikhail Gorbachev allowed Sakharov and Bonner to return to Moscow. Following Sakharov's death December 14, 1989, she established the Andrei Sakharov Foundation, and the Sakharov Archives in Moscow. In 1993, she donated Sakharov papers in the West to Brandeis University in the U.S.; in 2004, they were turned over to Harvard University. Bonner remained outspoken on democracy and human rights in Russia and worldwide. She joined the defenders of the Russian parliament during the August Coup and supported Boris Yeltsin during the constitutional crisis in early 1993. In 1994, outraged by what she called “genocide of the Chechen people,” Bonner resigned from Yeltsin's Human Rights Commission and became an outspoken opponent to Russian armed involvement in Chechnya and critical of the Kremlin for allegedly returning to KGB-style authoritarianism under Vladimir Putin. She was also critical of the European Union policy towards Israel. Bonner was among the 34 first signatories of the online anti-Putin manifesto "Putin must go," calling for the ouster of Prime Minister Vladimir Putin published March 10, 2010. In the last years of her life Bonner divided her time between Moscow and the United States, home to her two children, five grandchildren, one great-granddaughter, and two great-grandsons. She died of heart failure in Boston, Massachusetts, on June 18, 2011, aged 88. Her daughter, Tatiana Yankelevich, said that her mother wished to be buried in Moscow next to her husband, mother, and brother. Bonner is the author of Alone Together (Knopf 1987), and Mothers and Daughters (Knopf 1992), and wrote frequently on Russia and human rights. She was a recipient of many international human rights awards, including the Rafto Prize. The Professor Thorolf Rafto Memorial Prize is a human rights award established in a memory of a Norwegian human right activist, Thorolf Rafto. The Prize is awarded annually by the Rafto Foundation for Human Rights, which was founded in the humanistic tradition of the Helsinki Accords in order to promote the fundamental human rights of intellectual and political freedom. Other winners include former Nobel Peace Prize winners Aung Sun Suu Kyi and Kim Dae-jung. Bonner was also the recipient of the European Parliament’s Robert Schumann medal, the awards of International Humanist and Ethical Union, the World Women’s Alliance, the Adelaida Ristori Foundation, the U.S. National Endowment for Democracy, the Lithuanian Commemorative Medal of 13 January, and the Czech Republic Order of Tomas Garrigue Masaryk among others. In 2005, Bonner participated in They Chose Freedom, a four-part television documentary on the history of the Soviet dissident movement. ↑ Petition Calling For Putin's Ouster Gaining Momentum In Russia Radio Free Europe/Radio Liberty (March 11, 2010). Retrieved October 13, 2011. ↑ Alessandra Stanley and Michael Schwirtz, Elena Bonner, Widow of Sakharov, Dies at 88 The New York Times (June 19, 2011). Retrieved October 13, 2011. ↑ Sakharov's widow Yelena Bonner dies at 88 in U.S. - media RIA Novosti (June 19, 2011). Retrieved October 13, 2011. ↑ Rafto Prize, Lauretes. Retrieved September 24, 2008. All links retrieved February 16, 2013. An appeal to the world (April 12, 2002). An Open Letter to President Bush By Vladimir Bukovsky and Elena Bonner (March 10, 2003). This page was last modified on 16 February 2013, at 16:39.